December 30, 2013 /0 Comments/in Diabetes /by Jenn F.
For many weeks now, we’ve chronicled the problem of diabetic foot infections, ulcers, and amputations. It can be a deeply troubling topic, especially if you have diabetes and are already on the lookout for foot wounds. So this week we thought we’d bring you something a little more uplifting — a story about alternative prosthetic limbs that are blurring the line between art and medical science. Bespoke Innovations out of San Francisco is breaking new ground with their line of unique prosthetics. 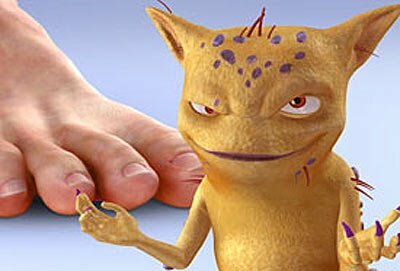 December 27, 2013 /0 Comments/in Toenail Fungus Treatments /by Jenn F.
Everyone knows the toenail fungus treatment Lamisil, thanks to its revolting mascot “Digger.” According to Forbes magazine, manufacturer Novartis spent $236 million on three years’ worth of ads, which resulted in a 19% jump in sales to $1.2 billion in 2004. For years, this salesman has captured the attention of consumers looking for a toenail fungus cure, despite its expensive. People continue to buy Lamisil in droves, thanks in part to enthusiastic doctor support and continued notoriety. However, the introduction of a generic version of terbinafine in 2006 threatened the drug’s stranglehold on the market and resulted in a 17% drop in Lamisil sales the first year it became available. So the question remains: Are you taking Lamisil and overpaying for your toenail fungus treatment? “Digger” made the Lamisil brand a household name. December 26, 2013 /1 Comment/in Athlete's Foot /by Jenn F.
Today we want to talk to you about a very serious issue: the socks in your drawer! These trusty companions accompany your feet each day, but how much thought have you really given them lately? Your mother probably buys them for you as Christmas gifts and you just assume that smelly feet or fungal infections are par for the course in this world. However, the type of socks we wear can be a contributing factor to athlete’s foot fungus and toenail infections. Are your socks contributing to foot fungus? December 24, 2013 /0 Comments/in Toenail Fungus /by Jenn F.
Yellow, crumbling fungus nails are the bane of many people’s existence. “Having gross toenails is a real blow to the self-esteem of my patients,” says Dr. Rob Lamberts, MD. “For some reason, it really bothers people,” he adds — even though it won’t put anyone in the hospital and causes no pain. It seems no matter how much money people spend or what they do, their unsightly condition will not clear up! It’s true that you will need to exercise patience until the fungus nail completely grows out — which could take up to a year, depending on how fast your nails grow. But the good news is that you can take these three steps to ensure that you are well on your way to enjoying fungus-free nails. Having fungus free nails will give you back your self confidence. Watch Your Feet: Photos Reveal How a Diabetic Foot Infection Can Grow in Just 10 Days! December 23, 2013 /0 Comments/in Diabetes /by Jenn F.
We’re not going to post the photo of a ten-day-old diabetic foot infection directly, out of respect for some of our more squeamish readers. After all, it is shockingly gruesome! It is almost beyond comprehension just how rapidly diabetic foot damage can spread once the blistering begins. If you are curious and would like a punch in the gut to fully comprehend the gravity of diabetic foot ulcers, then by all means, click here to see the photo. If you’d rather not see it, we understand. We will at least tell you about what happened to the poor 50-year-old man who suffered the lesions on his feet. Diabetic foot wounds can progress rapidly, so prevention is the best cure. December 20, 2013 /0 Comments/in Toenail Fungus Treatments /by Jenn F.
It doesn’t take a rocket scientist to figure out that crumbly, yellow, thick nails spell toenail fungus. Of course, if you want an official diagnosis, the average cost of visiting a podiatrist generally ranges from $50 to $100. Plus you’ll need to find a podiatrist who is accepting new patients and finagle your work schedule to make an appointment. It’s true – going to a doctor can be a pain! But what can you do? Do you need a prescription, or are there over-the-counter medications for toenail fungus? We’ve got the answer, and we weigh the costs. 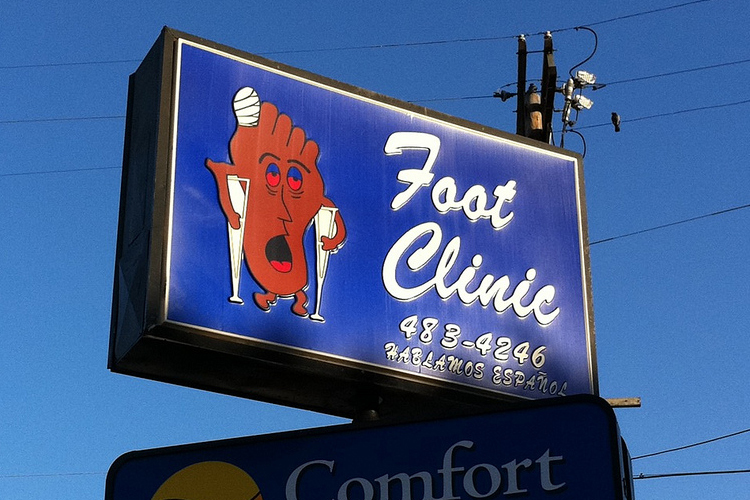 Going to a foot clinic may not be feasible for every patient suffering from toenail fungus. December 19, 2013 /0 Comments/in Athlete's Foot /by Jenn F.
We’ve all heard that athlete’s foot (scientifically known as tinea pedis) is one very contagious foot fungus. Yet, just how contagious is it? Should you be worried whenever you step foot in your gym’s locker room, or should you just avoid using other people’s towels to dry off? A few famous cases of athlete’s foot outbreaks show just how an epidemic can grow from just a few scales of foot fungus shed in a public place. It’s a wise idea to cover your feet in a public wash house, as these tinea pedis outbreaks clearly show.